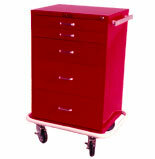 Standard Features: Tall Cabinet (30 inches / 76.2cm) with key locking system. Vinyl-wrapped full wrap-around bumper system. Five-inch (12.7cm) urethane single-wheel caster set, full swivel – two with brake.